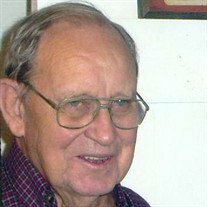 Alves "Bill" Ray Thompson, 90, of Gurdon, passed away on October 18, 2018. He was born June 20, 1928 in Oklahoma to the late Ross and Clara Thompson. When he was seventeen he enlisted in the United States Army to serve his Country. He later served in the Korean War. A true patriot who loved his Country, Bill went on to retire from the United States Air Force, after twenty-one years of service. After retirement, they moved to Okolona and established a cattle farm. He continued working full time in construction. He was a member of Okolona Baptist Church. Papa Bill was a great man who loved his family with passion. He approached life with that always present smile and sparkling blue eyes. He was gentle and kind to everyone he met. He is survived by his wife of sixty-six years, Evelyn Wallace Thompson; children, Vickie Lynn (Henry) and Rickie Thompson (Kathy); grandchildren, Leah Hughes (David), Cassie Gonzales (Justin), Cody Thompson (Kayla), and Andy Thompson (Jessi); great-grandchildren, Gabby and Bennett Gonzales, Kadin Rhodes, Easton, Brylee, Dane and Gage Hughes, and Emma, Raiden, and Harper Thompson; sister, Wanda Lambert, and a host of nieces, nephews, extended family and friends. Visitation will be 10:00 a.m. Monday, October 22, 2018 at Center Grove Methodist Church in Okolona. Funeral will follow at 11:00 a.m. at Center Ridge Cemetery. Join the family for food and fellowship afterwards, at the Okolona Community Center. Memorials may be made to Center Ridge Cemetery, in care of Jimmy Caldwell, 1755 Southfork Road, Gurdon, Arkansas 71743.